Antionette Wonsey, known as "Annie W." on Airbnb, has confirmed to LAUNCH that she received a citation from the Chicago police the night of Aug. 17 for failing to have a business license for renting rooms via Airbnb. She said she is scheduled to appear in court on Sept. 22. On Aug. 18, Antionette, who goes by Annie, posted a video of Chicago cops confronting her about bringing white tourists to her predominantly African American neighborhood, an incident that appeared to end with police issuing her a citation. 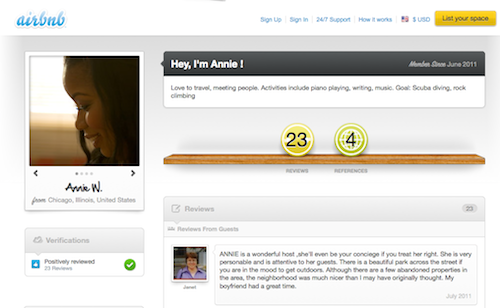 According to Annie's profile [ shown above and available here ], she joined Airbnb in June 2011. We will update as we obtain more information.